No more measuring. No more mess. Just toss and go! With double the cleaning power in every drop, you can trust your clothes will come out bright, white and clean! 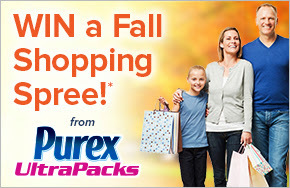 You can WIN a $750 shopping spree plus a year's supply of Purex UltraPacks and get noticed this Fall! Enter soon!